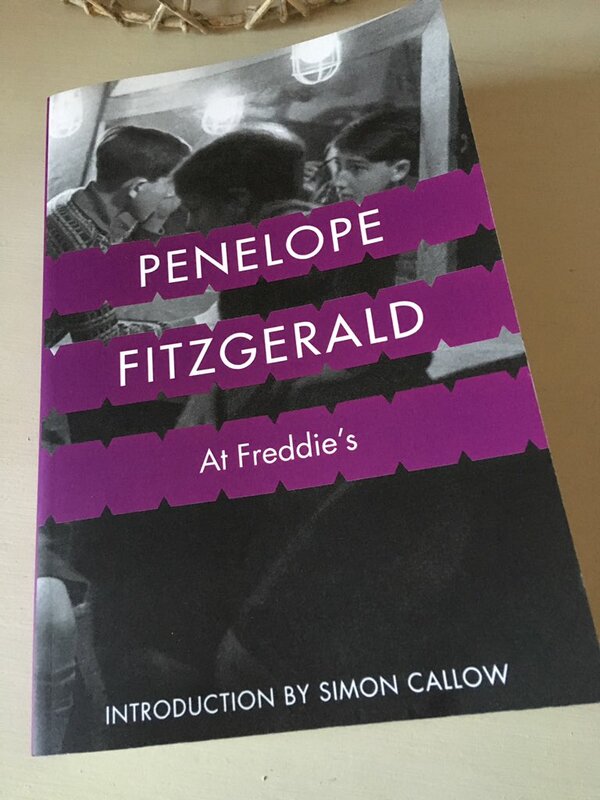 Set in a London stage school in the early 1960s, At Freddie’s is another of Penelope Fitzgerald’s marvellous tragicomedies, reasonably similar in style to her earlier works, Human Voices and Offshore. Many of the familiar elements from the author’s early novels are here – isolated women; hopeless, befuddled men; precocious children – all caught up in a somewhat eccentric, idiosyncratic community. Once again Fitzgerald has drawn on some of her own experiences in writing this book – in this instance, her time spent as a teacher at the Italia Conti drama school during the decade in question. It’s an excellent novel, both darkly comic and poignant, shot through with a deep understanding of the foibles of human nature both positive and negative. Situated in the midst of Covent Garden, the Temple Stage School is managed by the eponymous Freddie, an elderly matriarch and longstanding doyenne of the theatrical world. Aiding Freddie in this capacity is Miss Blewett – affectionately known as the Bluebell – her devoted assistant of several years. The school specialises in training children for classic roles, parts in Shakespeare’s plays, Peter Pan and other such staples. Naturally, Freddie’s pupils are terribly precious in a rather dramatic way, prone to overexcitement and competitiveness, qualities typified by the following passage. While Fitzgerald is primarily concerned with recreating a rather peculiar world, the novel does have a narrative thread of sorts, namely the perilous state of the school’s finances. (Pupils must carefully navigate the sagging floors and areas of disrepair to avoid any unpleasant accidents.) For years, Freddie has used her considerable and power and influence in the theatre community to keep the establishment going, procuring resources here and there to maintain the business. Moreover, when necessary, she has been successful in combating various adversaries, as evidenced by her success in staving off the creditors. However, now we are in the ‘60s, the surrounding world is beginning to change. The importance of television is growing, but Freddie remains wedded to the medium of theatre, a place where longevity and tradition are admired and treasured. Into the mix comes Mr Blatt, a potential investor in the school, if only he could make Freddie see sense. Blatt is dismayed at the lack of business management at the Temple, so he sets about making a number of sensible suggestions for improvement, all of which are promptly ignored. As far as Blatt sees things, the potential for TV and radio commercials is vast, but Freddie remains steadfast, at least until the novel’s closing stages. Fitzgerald is clearly making a point about the dynamics between artistic merit and commercialisation – that said, it never feels forced or laboured, just wonderfully ironic instead. Also threaded through the novel is a subplot involving the school’s only proper teachers, Hannah Graves and Pierce Carroll, both recently hired from Northern Ireland (naturally, as this is Freddie’s, they are being paid a pittance). Hannah is attracted to the romance and atmosphere of the theatre, a point successfully identified by Freddie during their discussions about the role, hence her ability to strike a bargain on the girl’s salary. Pierce, on the other hand, has no interest whatsoever in dramatic pursuits. Instead, he is simply grateful to have found a half-decent job, knowing his own value (or lack of it) in the wider world. As the weeks go by, Hannah and Pierce fall into a loose relationship with each another, one that seems doomed from the start. There is an excruciating proposal of marriage, followed by an even more desperate discussion in a Lyons tea shop, complete with waitresses itching to clear up and go home. Pierce is one of Fitzgerald’s classic hopeless men, aware of his own tragedy but clueless as to how to negate it. Interspersed with these storylines are various vignettes of life at the stage school and the theatre in general. We follow the progress of twelve-year-old Mattie (a bit of a prankster) and his gifted friend, Jonathan, both of whom have landed the role of Prince Arthur in Shakespeare’s King John. (Mattie is to play the part for the first twelve weeks followed by Jonathan for the remainder of the run.) There are also some highly amusing pen portraits of the various luvvies in the theatrical world, typically men with overinflated views of their own importance. Take William Beardless, for instance, the actor who has been hired to play King John – a performer whose reputation proceeds him. A visit from Noël Coward is another highlight, an occasion that prompts Mr Blatt to give nine-year old Jonathan a drink of whisky for courage, something that results in the young lad being sick in the boys’ toilets. Overall, At Freddie’s offers a marvellous insight into a rarefied world, that of a stage school struggling to survive in a time of change. The theatrical world in general is revealed as one characterised by resentments, jealousies, overinflated notions and egos, and yet there is also compassion and understanding too. As ever, Fitzgerald is wonderfully perceptive on the opportunities and disappointments of life, both big and small. The Covent Garden setting, with its traditional fruit and vegetable market, is also beautifully evoked. Once again, Penelope Fitzgerald confirms her status as one of my favourite writers. If they’re of interest, you can find my posts on some of her other novels here. At Freddie’s is published by Fourth Estate; personal copy. This entry was posted in Book Reviews, Fitzgerald Penelope and tagged #ReadWomen, 4th Estate, Book Review, Fiction, Penelope Fitzgerald, UK on February 12, 2019 by JacquiWine. Thank you! I’m glad my post has revived a few happy memories for you. It’s such a tricky thing, isn’t it, buying books for bookaholics? Most of my friends tend to steer clear of books unless they know I’d like something in particular (the Anthony Powell series, for example). Your friend clearly knows your tastes very well! Ooooh this is a Fitzgerald I have not read and it sounds just up my street – having loved Ballet Shoes and Curtain Call as a child, this seems to be the grown-up version of that! There’s a nod to that world for sure, but the Fitzgerald is a darker beast altogether. Wickedly funny at times and rather poignant too. I think she strikes that balance very well. Great review. Novels about art forms, such as theatre, are particularly interesting to me. I Understand that Fitzgerald taught at a couple of drama schools herself. Such experiences would give a book like this some authenticity for me. Yes, she taught at the Italia Conti Stage School during the 1960s, so I’m sure that experience came in handy as inspiration for Freddie’s. As you say, that kind of background gives a sense of authenticity to several details in the book. What an enticing review — many thanks. The next time I feel the need for a shot of Penny Fitz G I’ll try to remember to plump for this one, because it definitely sounds to be up my street. That’s great! I have a feeling you would like this one, John. It’s rather nicely observed. It is a one hour drama on RADIO4 EXTRA this week.Will listen to it i think. Oh, how timely. I’ll take a look at that in the schedules – thanks! Haven’t read this one, like some above, but will do at some point. Loved her trilogy in the Everyman hardback, including Offshore, Human Voices and Beginning of Spring. I’ve been trying to space them out, I must admit. They’re all so good! Her first, The Golden Child, feels less polished than the others, but even that has its priceless moments. A wonderful writer indeed. Lovely review, Jacqui. I don’t think I’ve ever come across a review of this before. It sounds marvelous. I’m pretty sure once I’ve picked up my first Penelope Fitzgerald I won’t want to stop and think it’s very possible, I’ll be reading this one too, sooner or later. I enjoy the setting. The hopeless charcaters sound tragic. I think it’s the worst to know one is somehow lacking but cannot change it. I don’t think I’ve seen it reviewed anywhere else either – a pity really, as it’s very good. There was a time a few years back when I could have quite happily binged on the whole lot — historical novels included, and maybe even a biography or two. But then I decided to space them out a little, just to have some more PF to look forward to in the future. I think there’s every chance you will love her too. She does that blend of comedy and tragedy so well, and with a lightness of touch that makes it seem effortless (even though I’m sure it’s not). It’s a common factor in this, Offshore, Human Voices and possibly some of the others too. I agree, that lightness of touch cannot be easy to do. She certainly sounds wonderful. I might start with The Bookshop. That would be a great starting point, a perfect introduction to her work. This sounds wonderful. Freddie sounds like such a marvellous character. I haven’t read Human Voices but I loved Offshore so if it is in a similar vein I will love it. I adore that quote about the children. Brilliant review. She’s brilliant, wonderfully eccentric in the best possible sense. I think you’d have a lot of fun with this book; it’s a good one for a dull and dreary day. You had me at stage school! As someone who did a Masters in Drams this is very appealing. I’m very tempted by this one, thanks for the great review. Hooray! That’s one of the things that attracted me to this novel, the stage school/theatrical setting – it’s just perfect for this type of fiction. I can’t recall if you’ve read Beryl Bainbridge’s An Awfully Big Adventure, but there’s an element of that novel here, especially in the portrayal of the acting world. I loved the Bookshop – this is definitely going on the list! Check out this review of the book, At Freddie’s, by Penelope Fitzgerald, as featured in this post from Jacqui Wine’s blog. Many thanks for sharing my piece, Don Massenzio, very much appreciated. “Meanwhile he went on climbing and jumping, again and again and again into the darkness”. Yes! Such a striking conclusion to the story. I think she’s strong on endings in general, but this one is particularly good. Indeed! It appears to be much bigger than the stage school alone. Actually, Simon (Stuck in a book) reviewed that novel a few years back. I was already a devoted reader of PF and was looking her up on the Internet for some reason. Simon’s post popped up, and that’s how I discovered the wonderful world of book bloggers which literally changed my life. I’ve just had a look at your previous reviews and you still have Innocence, The Gate of Angels, and The Blue Flower to read, lucky you ! So many pleasures in store for you. How fortuitous! I can’t quite recall how I stumbled across the book blogging community (possibly via someone I’d been following on Twitter), but I’m with you on the impact. It’s completely revolutionised my reading too, from the way I chose books to the conversations I have about them. Thanks for letting me know about Simon’s review of Freddie’s, something to check out at some point. I can imagine him loving it, especially all the drama stuff! Somehow I didn’t spot your comment before, Izzy, even though I commented just below it – how lovely that that was how you entered the wonderful book blogosphere! Lovely review! This might well be my favourite PF novel I’ve read – the perfect setting for her style of writing. Thanks, Simon! It’s the ideal environment, isn’t it? Just perfect for her subtle blend of comedy and tragedy. I loved all the scenes between Hannah and Pierce – classic Fitzgerald with a dash of Elizabeth Taylor for good measure.